ReNtoFa this was so much fun to watch! 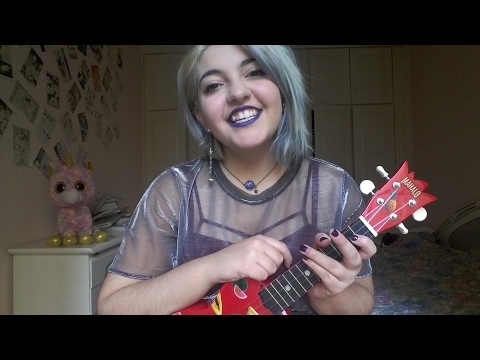 You obviously have a great time arranging and recording with your ukulele and that really comes through your videos (yes, I enjoyed it so much I have been watched some of your others). Vocally you are confident and secure and your sense of fun is contagious – you really use your facial expressions well. I really like that you have your own style but you might want to think about how that impacts on your singing. Although your posture is pretty good you make things quite tricky for yourself by sitting on a bed. It looks great for a bedroom video but such a soft surface makes it hard to keep a good alignment. You might also want to try increasing the energy in your articulation as you tend to slur your words together and not finish them off – which is sometimes quite nice and dreamy but at other times losing the consonants takes away the energy of the melody and dampens your ability to get any real dynamic energy into the melody. This singer was an entrant in our competition which ended on June 15th 2017.